There are brands so familiar that despite regular use, I hardly ever think about reviewing them anymore. I take them for granted and project my shameful lack of appreciation on everyone else, too. My Beauty Diary, the first brand I ever wrote about on this blog, is one of the brands I often forget to appreciate. I’ve gone through dozens of boxes of these Taiwanese sheet masks with hardly a word about them. 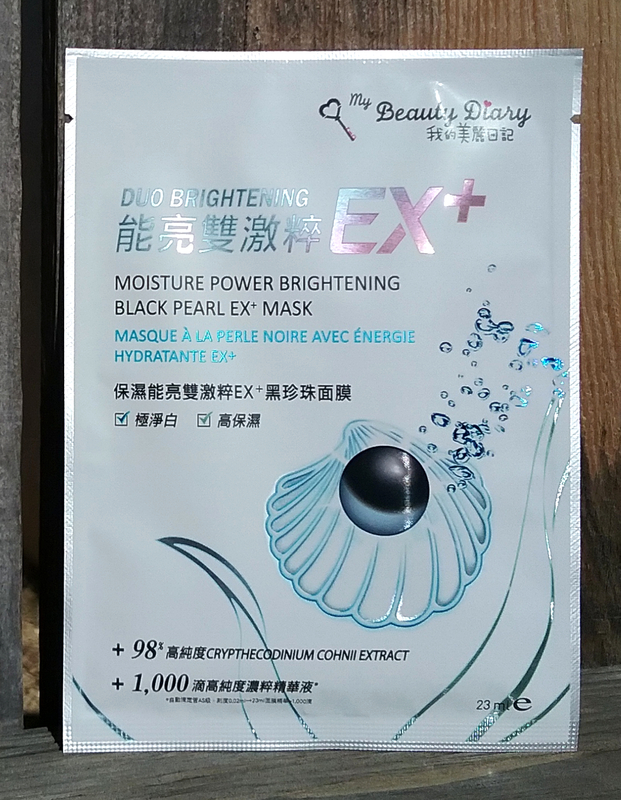 But I finally found a flavor interesting enough to want to blog about it, so here are some thoughts on the My Beauty Diary Duo Brightening Moisture Power Brightening Black Pearl EX+ Mask. This post contains affiliate links, which enable me to receive a small commission on purchases made by clicking the links. Affiliate links are marked with an asterisk(*). MBD design has come a long way since the days when the pixelated box graphics caused mass “is this a fake product” panics. I bought a box of these masks at a physical AB store late last year, the same day that I bought that Skin Aqua sunscreen while out with Beauty and the Cat‘s Angela and Renee. Purpose: My Beauty Diary Duo Brightening Moisture Power Brightening Black Pearl EX+ Mask (which I’ll be calling the Black Pearl EX+ Mask from now on) claims to intensely brighten and moisturize skin. Do not use if: You are sensitive to glycols, triethanolamine, citrus extracts, or anything else in the ingredients list. When and how to use: Use after any toner, essence, and serum steps in your skincare routine. (Curious about why I do sheet masks so late in a routine? Read this.) Remove mask from pouch. Unfold and remove plastic backing. Apply to face, smoothing down so that the material lays flat on skin. Leave on for 20-30 minutes, or longer if desired. After removing, pat in any excess essence and follow with your moisturizer or sleeping pack. I used to be able to read traditional Chinese fluently, but I’m out of practice now. So gleaning any kind of information from this was fun. 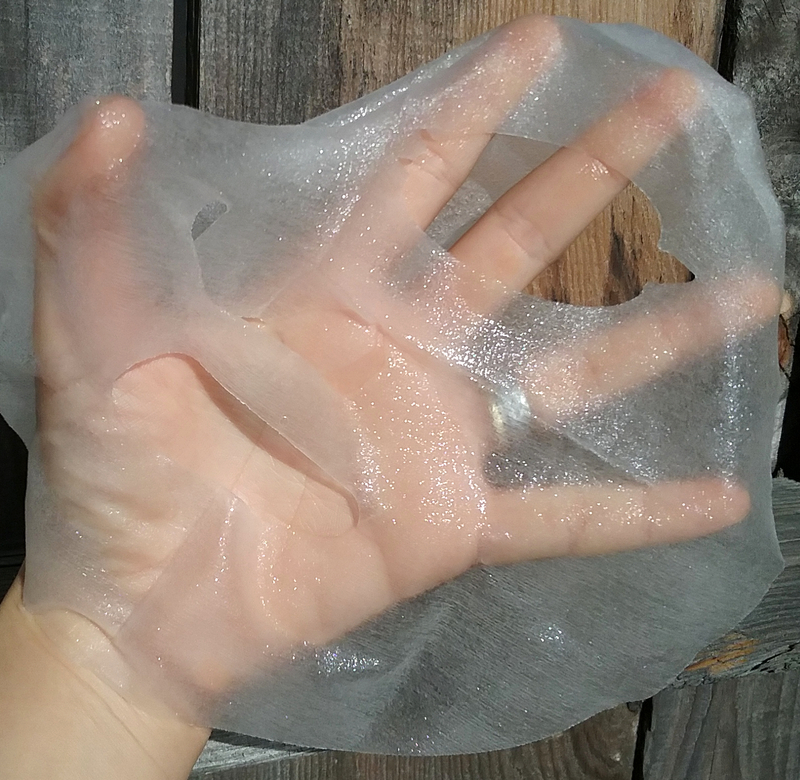 Ingredient notes: It’s a sheet mask, so most of the volume of the essence is taken up by water and by the humectants that hold the water on your skin and help your skin hold the water. The fun-sounding other ingredients later on won’t be present in large doses. With that being said, this is My Beauty Diary, and they generally create effective mask formulations, so the other ingredients are worth a look. Extract-wise, the heavy hitter in the Black Pearl EX+ sheet masks is the glycyrrhiza glabra (licorice) root extract. One of the more extensively researched plant extracts in cosmetics, licorice root extract is used for its topical skin-brightening and hyperpigmentation-reducing, anti-inflammatory, and antioxidant properties. My skin tends to respond well to it. I ragequit Missha’s Time Revolution The First Treatment Essence specifically because they removed licorice root extract. I really like licorice extract. The Black Pearl EX+ masks also contain orange and lemon fruit extracts. 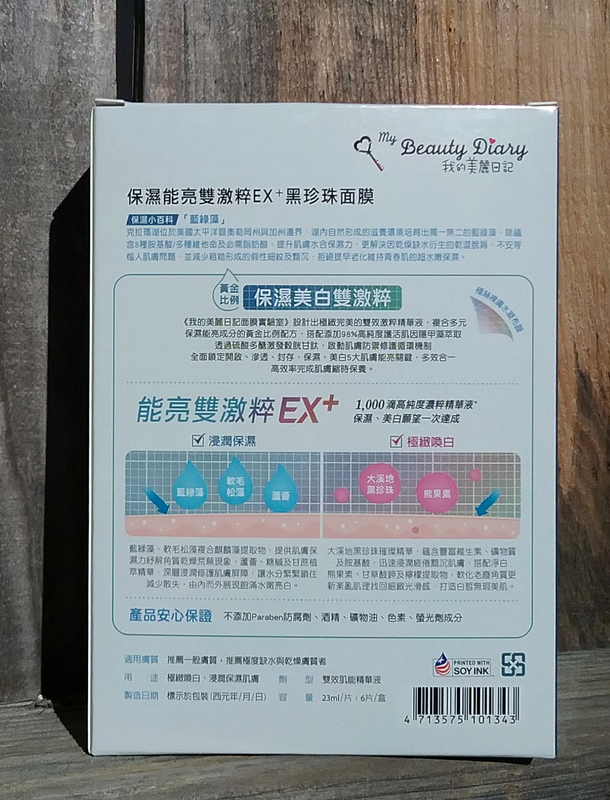 I doubt there is enough of either in this product (and I doubt the extracts are concentrated enough anyway) to have any significant effect on anything (except allergies and sensitivities), but I’m pointing them out to quickly discuss the difference between the extracts and using the actual fruit juices on one’s face. Citrus juices should not be applied directly to skin. They’re far too acidic, sensitizing, irritating, and can cause phytophotodermatitis with sun exposure. Extracts are a different story; I’ve personally never had problems with citrus extracts in skincare. As I mentioned, the extracts are probably pretty diluted and there won’t be much of them present anyway. Take that as you will. The packaging for these masks boasts 98% pure crypthecodinium cohnii extract, which was a nightmare to type but fun to read up on. Crypthecodinium cohnii is a “dinoflagellate” microalgae. “Dinoflagellate” may sound like a T-rex with a penchant for punishment, but it actually means a single-celled organism with two little whip arms. That has no relevance to anything, but isn’t the idea of a T-rex with a fetish kind of cute? Speaking of dinosaurs, does Gong Yoo look like a dinosaur to you too? Anyway, crypthecodinium cohnii is a “prolific producer” of the essential fatty acid DHA, which may have protective, anti-inflammatory, reparative, and moisturizing effects when applied topically. Using the plankton extract seems a roundabout way to include DHA in a product, if that’s what it’s there for, but there may be other antioxidant and moisturizing benefits as well. Don’t expect the extract to be 98% of the mask juice’s total volume, though. Here, that percentage represents the concentration of the crypthecodinium cohnii in the extract ingredient. The other 2% of the extract is probably water, and the extract ingredient is likely present at a very low % of the mask juice total volume. Hooray for confusing packaging claims. 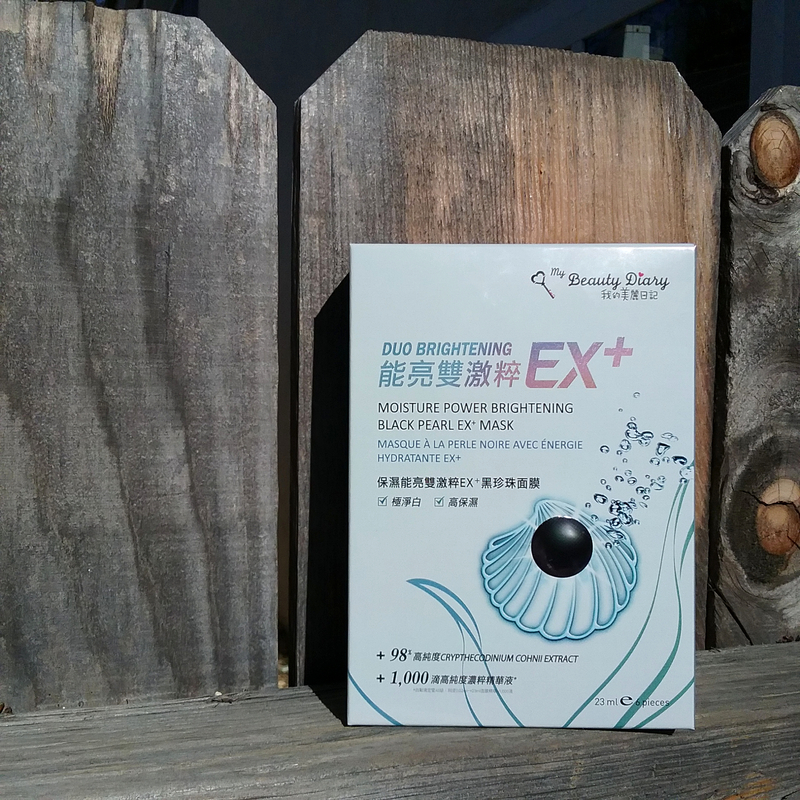 Like the 2015 My Beauty Diary sheet masks and the brand’s other post-2015 releases, the Black Pearl EX+ masks use a thin, translucent, and fairly pliable material that’s much less frightening to behold than the thicker pre-2015 material. Despite its thinness, the material holds a ton of liquid, as expected from MBD. These are some of the easiest masks to go check the mail in. Hardly noticeable from a distance. These masks don’t cling as closely as some other ultra-thin T-beauty masks do. They’re not stiff, but I get a little bunching and shifting with them, especially around my chin, where I need to fold them up a bit under the bottom of my face. They’re also cut lower on the forehead than I’d like. My forehead is vast, so I can’t blame the brand for failing to accommodate it, but I always wish MBDs were roomier. As is standard for just about every T-beauty mask on the market except Lovemore’s, the My Beauty Diary Black Pearl EX+ masks stay wet for 45 minutes to an hour on my face. 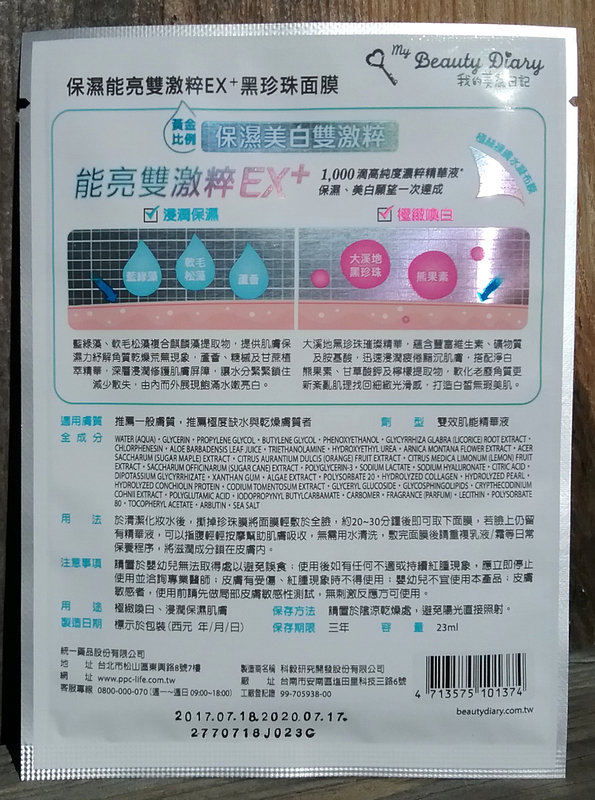 This is thanks to a combination of the amount of liquid saturating the sheet, the mask sheet material’s liquid-holding ability, and the essence formulation itself. I’ve used other masks that started out just as wet and with just as much essence but dried out much more quickly. The advantage of the essence’s resistance to evaporation is that much more of it seems to end up in my skin than with many other sheet masks. The ability to comfortably wear these masks for such a long time also helps maximize absorption of the product and effects of the essence. No, not all of the mask’s stated 23ml of product will end up in my face (that would be ridiculous and, frankly, terrifying), but a substantial amount of it does compared to many other sheet masks. I can tell by the results. The main results of these masks are insanely hydrated skin. Insanely. It’s exactly the kind of hydrated skin that AB fans look for: plump and bouncy, the upper layers so full of hydration that skin gains a milky translucence from all the extra water beneath the surface. It’s skin that seems to drink in light, refracting it back out as a soft inner glow, rather than skin that just reflects it from a shiny surface. Luminous. Nearly all the My Beauty Diary masks I’ve tried will give that ultra hydrated, lit from within effect, but the Black Pearl EX+ masks take it to an extreme, and the results last longer. I find my skin looks and feels so happy even the next evening that I usually skip sheet masking the night after using one of these. Surface texture stays smooth and the extra bounce lingers. On the other hand, despite the Black Pearl designation of these masks, they don’t perform the same ~brightening~ function as the regular (and less expensive per mask) Black Pearl Brightening* variety. The regular Black Pearl masks brighten so much that when I take them off, I’m left with a visible line on my forehead outlining where the mask stops and my face keeps going. The Black Pearl EX+ masks don’t. Instead, the brightening effects these masks have come almost entirely from redness reduction. They even out my skin tone and soothe any irritated patches but don’t affect actual skin color, even temporarily. Whether this is a plus or minus depends on your skin goals, but it is a notable difference compared to the regular Black Pearl flavor. While I love shopping and really love shopping with good friends (Gude friends! ), the physical store markup on these masks would have made me hesitate to buy them were they not MBD. Fortunately, I’m already familiar enough with MBD’s consistent quality to risk the purchase. I’m glad I did–these masks gave me great results. I’d be happy to use more. My Beauty Diary masks rarely disappoint me. The Moisture Power Brightening Black Pearl EX+ Masks follow the expected pattern: above average comfort and excellent results at a pretty reasonable price. The hydrating effects of these masks stand out from the crowd, and the calming and redness reduction effects seal the deal. They do cost more per mask than the standard MBD flavors but delivered more intensive benefits for me than the standard flavors, too. Where can I buy My Beauty Diary Moisture Power Brightening Black Pearl EX+ Mask? MBD masks can be found at many brick and mortar Asian beauty stores and supermarkets in major cities. The Moisture Power Brightening Black Pearl EX+ Mask is also available in boxes of 6 on Amazon Prime*.